If you are always looking for a way to produce an earlier crop of onions then consider planting autumn onion sets to steal a march on the competition. You can choose the original Japanese autumn onion sets or there are a number of new British bred varieties. 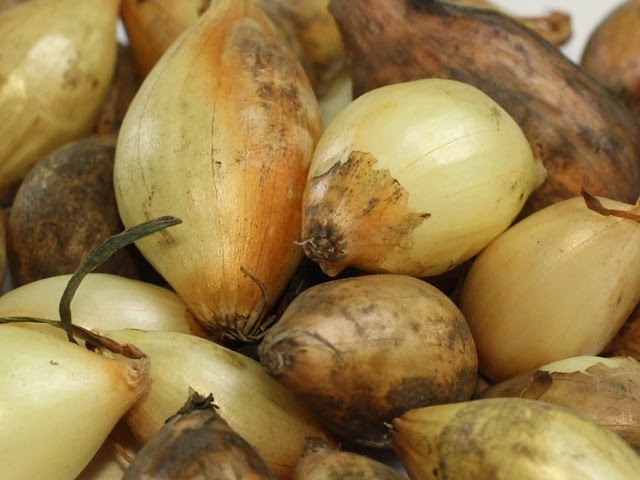 Onion 'Shakespeare' is a particularly good cultivar which forms good sized bulbs, has superb overwintering and storage. While it is true that onions sets are traditionally planted in the spring, the advantage of planting autumn sets means that they can be harvested earlier than spring planted sets, just as your stored onion crops are beginning to run out. Before planting, prepare the ground several weeks earlier by digging in plenty of well-rotted garden compost to improve drainage and soil fertility. Avoid the temptation of using farm manure as this contains far more nitrogen than your onions require and will result in a poorer crop. 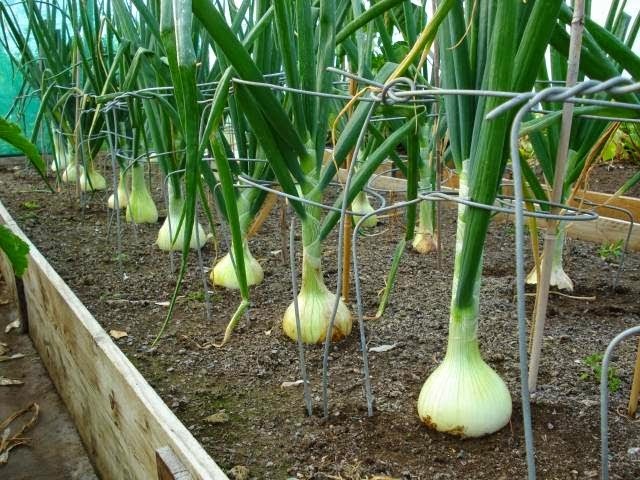 If you are growing on particularly wet ground, then try growing onion sets on ridge or better still in raised beds. If your onions become waterlogged they can become prone to fungal root infections. Onion sets are best planted in rows in a firm, well drained soil. When planting, make sure that the tip of the bulb is just showing through the soil surface. Leave a space of 4 inches between each bulb, and 12 inches between the rows. At this point is can be worth applying a suitable granular onion fertiliser around the base of each set as you plant them. Newly planted onion sets are at risk from being removed from the ground by birds so it is generally worth covering your newly planted crop with a protective netting or fleece. 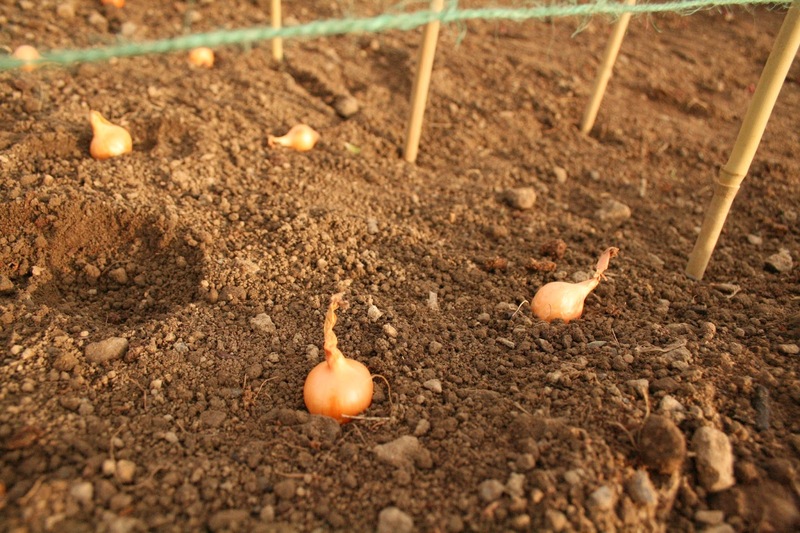 Onions sets need very little once in place and will require watering only during periods of particularly dry weather. It will be important to keep the weeds down around your onion crop as these will over compete for soil nutrients and can result in a stunted crop. Use a hoe to control weeds in between the rows but hand weed between onions to prevent damage to the bulbs from hand tools. Autumn planted onions should be ready for harvest from late June or early July, a week or two after the leaves begin to turn yellow. This is usually a month or so earlier than spring planted onion sets.